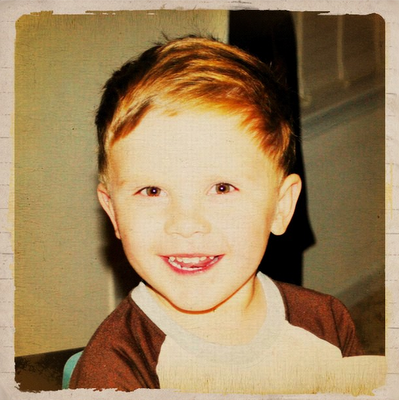 Just Another Day...: HAPPY 3rd BIRTHDAY, CHASE! We are so very grateful to have our son with us and not a day goes by that we don't thank God for His hand of healing and protection on our sweet boy. I am still beside myself that we have been blessed with this kiddo in our lives and that we're celebrating his 3rd birthday TODAY! I'm so in love with this boy and am blown away by his incredibly amazing awesomeness! As I make the last few party preparations for his big celebration tomorrow, I can't help but think about his birth and the unbelievable first few weeks of his life. He's been fighting to survive since he entered this world and he is so very strong... he's my hero and a living, breathing miracle walking around in front of my eyes! 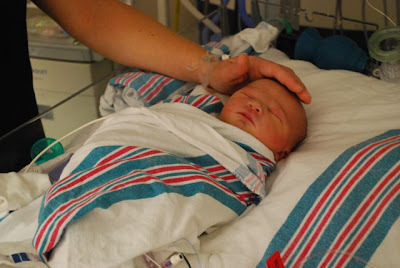 His birth was obviously so very different than LO's, and I wanted to take a moment this morning to reflect on what my family experienced during his first week of life. Also, I wanted to say THANK YOU to those of you who have loved us, supported us, cared about us, prayed for us, and been there for us during this tumultuous journey God placed us on. Without your love and support, I just don't know where we'd be, so THANK YOU!!! Whew! What a week it's been! My sweet baby boy arrived on Monday and our lives have definitely changed dramatically! I fell in love with my Chase at first sight! He's perfect! I'll write the labor/delivery post eventually, but right now I'll let you know what's happened since his big arrival. 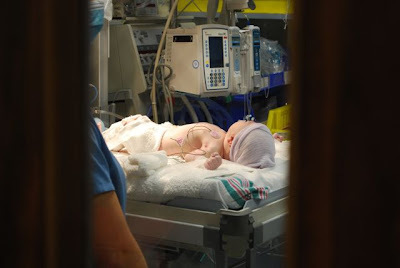 After Chase was born, he was whisked away to a stabilization room so the NICU staff could get a line put in his umbilical cord and do all of their standard tests. They finished with me in the operating room and took me back to my labor room to recover. 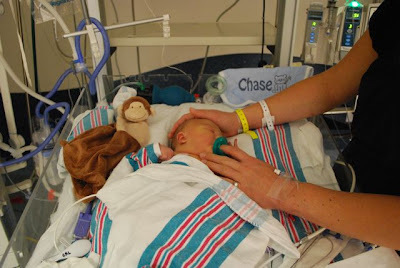 About an hour or so later, the NICU team brought Chase to my room so I could see him for the first time. I also got to hold him for about 15 minutes! It was pure bliss!!! I was so happy to finally hold my precious son in my arms after getting to know him over the past 9 months. I wanted to let hubs hold him for a minute or two, but I just couldn't let go! Before I knew it, they had to take him up to the PCICU to get him settled. Later that night, we got to go up to the PCICU to see him. He looked so beautiful! On Tuesday, we were told that they wanted to intubate Chase (put in a breathing tube) not because he was having trouble breathing, but because he needed help balancing levels in his blood (Note: I don't have a medical degree so I'm sure I sound like I have no clue what I'm talking about, mostly because I don't). Basically he had too much lactic acid in his blood and putting in a breathing tube would help him with this. They also put in an ng tube (it goes through his nose into his stomach) so they could give him some nutrition directly into his stomach. 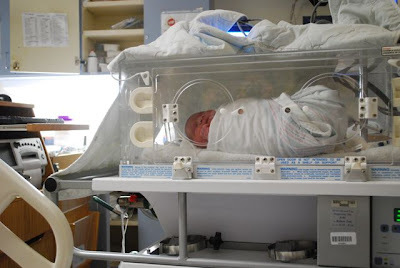 It was really hard to see him with the tubes in and not be able to see his cute little cheeks! But knowing it was what Chase needed made it a little bit easier for me to accept. Wednesday they told us they'd want to take Chase to the cath lab to put in a PICC line in his arm. 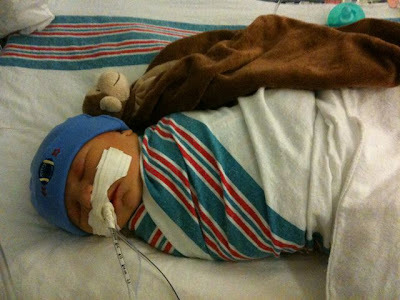 The reason he needed this was so they could give him better nutrition through the PICC line than what they were already putting in through his umbilical line. It was planned for 2nd case this morning, which we were told would be around 10 or 11 AM. Imagine my surprise when hubs' phone rang at 8:15 AM this morning with a call from the PCICU requesting our authorization to do the procedure. Apparently the 1st case canceled and we were moved up. This meant Chase went into the cath lab around 9 AM and we weren't there to see him before the procedure! I was heartbroken, but I knew he was in good hands. I checked in later to find out how he was doing, and he did a great job! When we got to the hospital to see him after the procedure, he was still completely sedated, but he looked so good!!! It's hard to see him laying there, not able to move, but I loved touching him and whispering to him that I was there with him! Hubs and I met with one of the surgeons last night, Dr. Hsia. We discussed the surgery schedule and were told that Dr. Bradley, the surgeon we originally wanted to do Chase's Norwood surgery, would be out of town Thursday through Monday, returning on Tuesday of next week. This means the earliest he could do Chase's surgery would be Wednesday, November 4th. 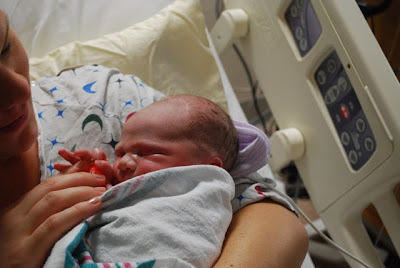 The typical "comfort level" for performing a Norwood procedure is within 7 days from birth. The other option we have would be for Dr. Hsia to do the surgery. Ultimately it came down to timing, which we looked to Chase to determine what would be best. Based on his "numbers" (essentially they are playing "mother nature" by trying to keep his numbers at a safe level), it seems as though it'd be better to do his surgery sooner rather than later. There are two main reasons for this: 1) One of the medications he's on (Prostaglandin) that's used to keep his PDA open, is essentially "marinating" his tissue, meaning the longer he's on this medication before surgery, the more difficult it will be to operate because the tissue will be very soft and pliable; and 2) His body is pumping more blood to his lungs than to the rest of his body, meaning his vital organs (brain, heart, etc.) are not getting enough oxygenated blood. Obviously he needs to keep these organs safe and prevent any permanent damage, so the sooner we do the surgery, the better. Hubs and I decided it would be best for Chase for us to go ahead with the surgery on Monday morning. He'll be taken back around 6AM and should be finished by 3PM. The good news is I'll definitely be able to hold him Sunday night and/or Monday morning. WOOT! The bad news is I'm so very scared! I can't even put in words how hard it is to know I'll be handing my newborn child over to a surgeon to save his life! Please be praying for us as we prepare for this extremely difficult day! I know God is in complete control and is working out His will for Chase's life before our very eyes!